As some of you may already know, I’ve been suffering with eczema, IBS, anxiety and low mood for many years (click here to find out more). My immune system seems to be very active and so I have a lot of inflammation in my body. Chronic inflammation is bad news as it’s the precursor to many chronic diseases, which is worrying, so I try to eat as many anti-inflammatory foods as possible. Turmeric being one of them. Turmeric is said to be one of the best natural anti-inflammatory agents out there, definitely something to include in the diet, especially if you have any kind of auto-immune conditions and allergies. Use black pepper – it increases the bioavailability of curcumin, the active compound in turmeric*. 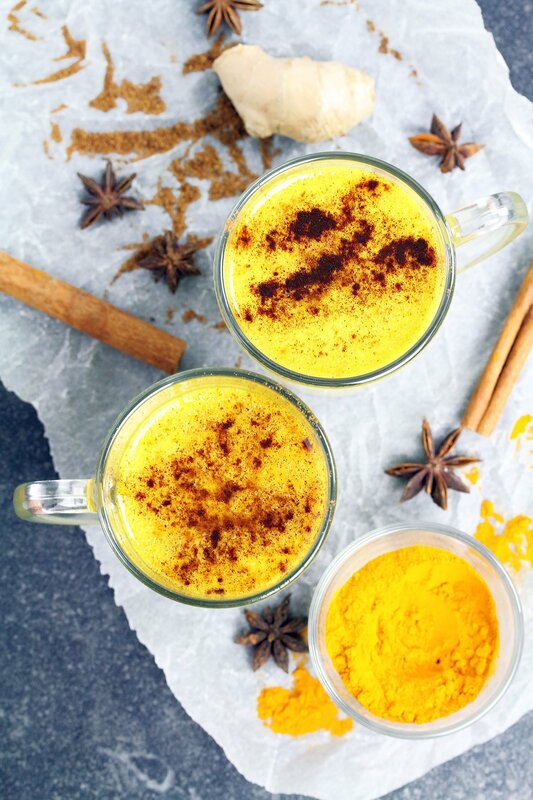 Add fats – consuming a small amount of fat at the same time as turmeric also increase its bioavailability. The fat allows the turmeric to be directly absorbed into the blood stream, in effect bypassing the liver*. 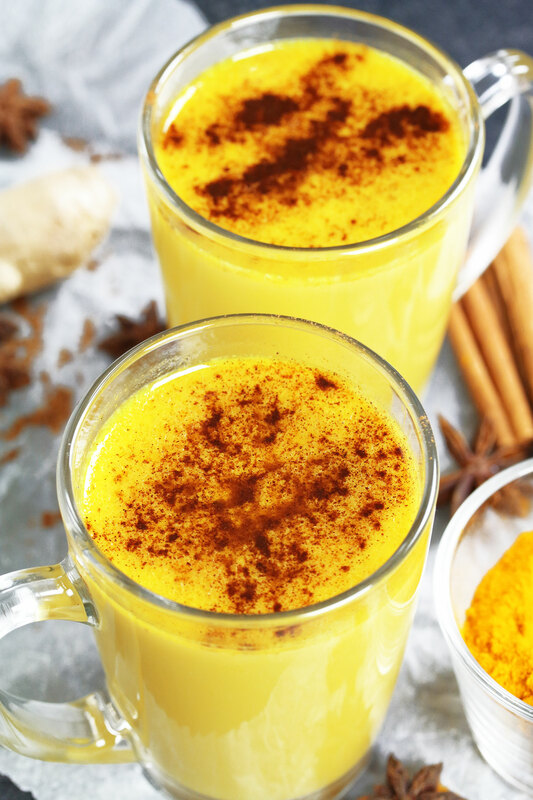 As well as being anti-inflammatory, turmeric has other benefits, like being linked to a decrease in joint swelling and stiffness. One research (although fairly small), showed that consuming turmeric improved Rheumatoid Arthritis symptoms**. It also has a chemopreventive property and can potentially reduce the risk of cancer***. The other great thing about turmeric is that it offers all these benefits without having any known side effects. Something that cannot be said about many drugs and medications. 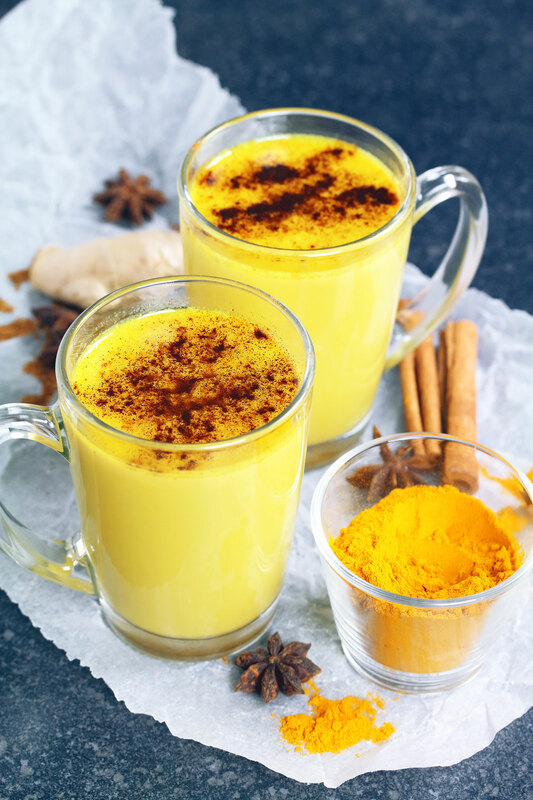 I’m not in any way implying that turmeric is a cure and prevention for all diseases, but there is no question that adding it to our diets will only benefit our health. 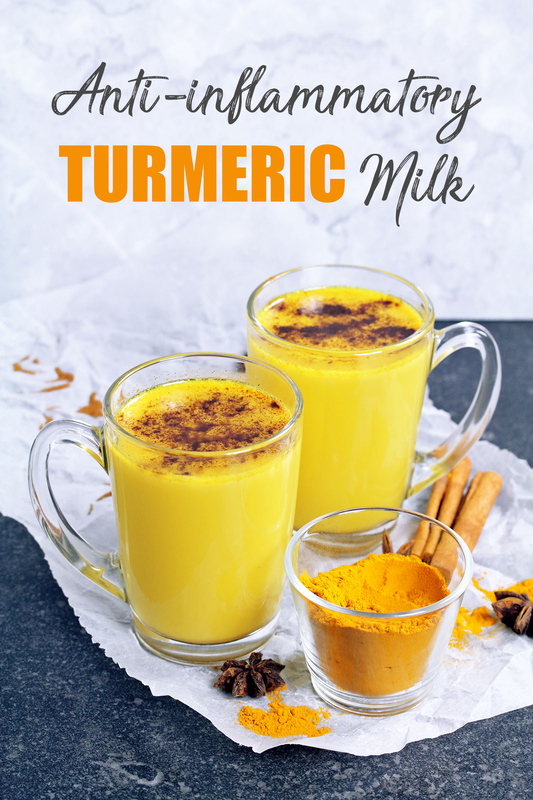 Plus, turmeric milk is super delicious and comforting 😍 and has the most beautiful golden tone, hence the name golden milk. 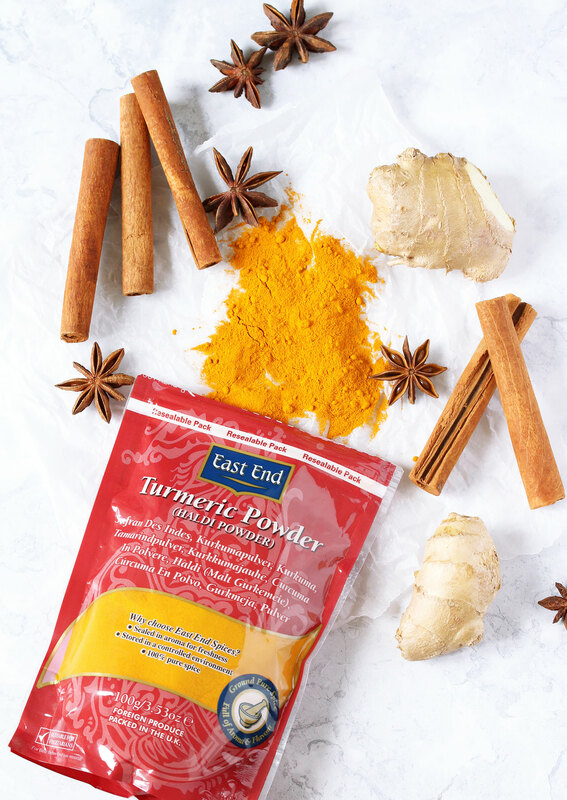 I created this recipe for East End Foods using their turmeric powder. They only use the finest spices from around the world, store them under climate controlled conditions and re-clean them using the very latest technology to help retain their purity, fresh aroma and flavour. I’ve said this before, but I always buy my spices from the ‘world food’ section in the supermarket. They’re much cheaper and I feel the quality is so much better compared to those small jars of herbs and spices you get in the spice aisle. You can also get bigger packs meaning you don’t have to add them onto your shopping list as often. That’s super important for someone like me who uses them on the daily! Add all the ingredients to a saucepan. Bring to a low boil, then reduce the heat and leave to simmer for 5 minutes. Strain into glasses and enjoy! Thanks to East End Foods for sponsoring this post. Commissioned posts is how I’m able to continue working on the blog and creating recipes and recipe videos for you. As always, all opinions are my own. 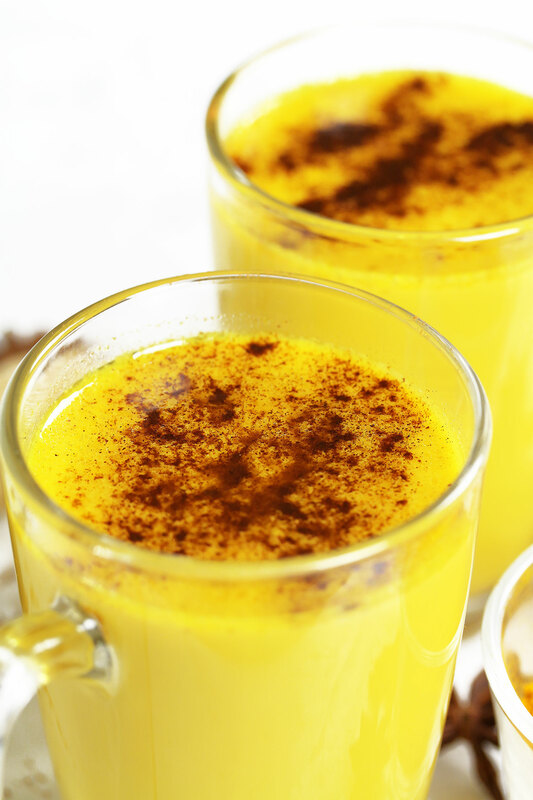 Had this golden milk once made with oat milk…yours looks very tempting topped with coconut sugar. I DEFINITELY need more turmeric in my life! Besides, given that I am currently sick, it will add so many benefits to my immune system! Thank you for sharing such a wonderful drink that is not only tasty but also wholesome for our body & mind. its so much easy to make, looks so delicious. I liked it so much! If I don’t finish a batch, will it still be nice if I store it in the fridge and heat it up the next day? Love this home remedie. We’ve hired an aryuvedic practitioner who said this recipe originated from the people of the Himalayan mountains. People are using our home remedies and luckily we can say it makes a difference for people. I love this site spreading free recipes for good health. Keep up the good work! I’m going to try this with soy milk when I get home. Great article and lovely fotos. It does look super yummy 😀 About to give it a try now !